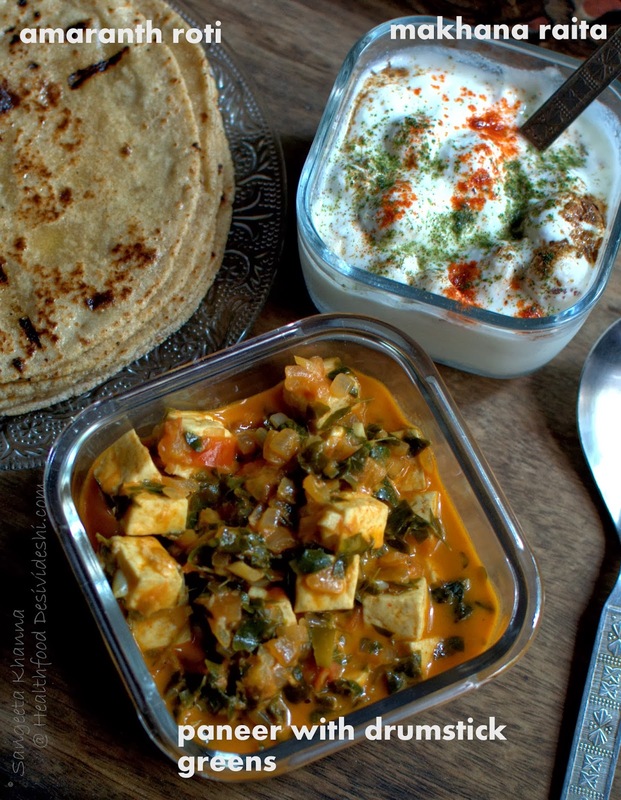 How would drumstick greens taste when paired with paneer in a regular tomato based creamy paneer curry made north India style? I am sure you were wondering about a weird tasting 'healthy' curry that you have to gulp down with water after every mouthful. What if I tell you to recall methi matar malai? Yes this curry can be served as methi matar malai if you add some green peas to it. There is a subtle difference of flavors but that can be differentiated by only those who have a sensitive palate. I would emphasize at the same time, that the flavors of drumstick leaves in a slightly creamy curry is wonderful even if not compared to fenugreek leaves. Drumstick greens have a nice aroma of their own which shines well with a slightly sour ingredient, a little added fat in the form of cream or butter balances the flavors nicely. Try to find tender drumstick greens so they are less fibrous and the flavors are mild. The mature leaves are slightly bitter and alkaline in taste. Use lesser amount of drumstick greens if using mature leaves. Heat mustard oil in a pan (kadhai) and tip in the chopped onion along with salt and fry till pinkish brown. Add the ginger garlic paste and bhuno (cook while scraping the mixture) the mix for about 2-3 minutes or till it looks glazed and gets aromatic. Add all the powdered spices along with 2 tbsp water, mix and bhuno again on low flame till all the spices get aromatic and stop sticking to the surface of the pan. Add the chopped drumstick leaves and the tejpatta, bhuno again till the leaves get limp, make a paste of the tomatoes in the meanwhile and add that to the cooking mixture. Cook well while stirring till the mixture gets aromatic again. Add the paneer cubes, add a cup of water and mix everything well. Simmer on low flame for 5 minutes adding a little more water if required. Add fresh cream in the end, let it come to a soft boil and take the pan off the heat. Serve hot with roti or naan. We had it with amaranth flour rotis (whole wheat and amaranth flour in a ratio of 1:3) and makhane ka raita. To make makhane ka raita, just soak a cup of makhana in hot water for an hour or so. Squeeze lightly and add to a cup of beaten yogurt with salt and pepper. Garnish with mint powder or chopped mint and a little red chilly powder. Roasted cumin powder can be added if you wish. Good taste can just be a simple recipe away. Just use good ingredients I say. You keep seeing many unusual ingredients on this blog and probably come back to see more of such stuff here. Right? This curry wont be unusual once you make it, it is such a normal paneer curry like we make with any other greens. I have a drumstick tree and had planted a few saplings in pots for giving away to whoever wanted them, as announced in this post about a colocasia stir fry with drumstick greens. You can also mail me if you want a drumstick sapling and can pick up from my place in New Delhi. I will be glad to gift a drumstick sapling to those who can grow it. 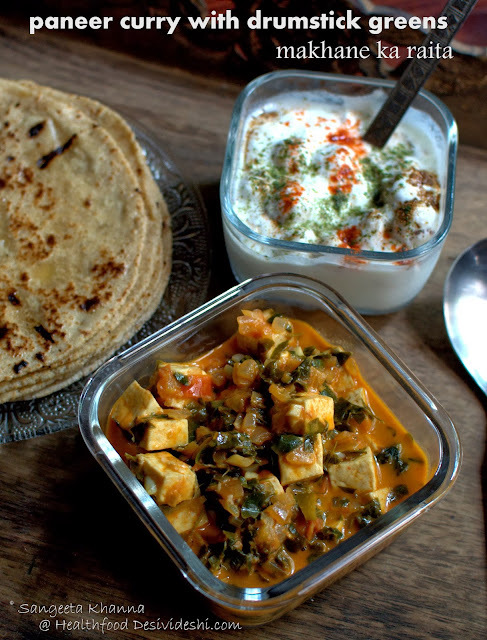 Make an egg scramble with drumstick leaves or just make parathas with them. Add them to any daals you make for a change and see how easy it is to include these naturally organic greens growing in a pot in your sunny balcony. Don't know about drumstick greens, but I do love all the veggies. Those flatbread look great too.